Special Offer: A free Find a Rainbow Prize - Congratulations you have won a prize! is available when you order £27.50 or more of selected products. The New Reusable Nappy System from Bumgenius! Elemental Joy is an economic reusable nappy system. It consists of a waterproof layer with a single layer of fleece stitched inside with a gap for you to add absorbent inserts. Inserts are not included, so you can stuff with existing inserts and save money, or you can buy the Birds Eye cotton inserts separately. Suitable from 8-35lbs and grows with your baby using the patented popper system on the front to change between small, medium and large settings as your child grows. Fastens using hard-wearing poppers on the waistband. All returns must be returned to us within 30 days after you receive your delivery, following the steps outlined below. Items must be returned unused in their original packaging, and arrive back with us in a resaleable condition. Pack everything up carefully and securely in suitable outer packaging (eg a box with sufficient protective material) so as not to damage the product packaging. Please do not put labels directly onto products for return, these will be classed as non-saleable. With all returns, please include a completed returns form (including order number). This can be downloaded here: Click here to download a returns form. If you do not have a printer, just write out the details on the form on a page and include it with your return. Please allow up to 7 working days for our team to process the return. Refunds will be done via the method you paid. Christmas returns. We know you shop early for Christmas, so for any items bought between September & December, you can return up until the 7th January with a no quibble return guarantee. Shipping & Handling - Customers are accountable for return shipping charges. Remember PayPal returns may refund your shipping costs if you have purchased using them, details Paypal Shipping. We suggest a recorded or signed for delivery service so the parcel is insured and can be tracked. Goods are the customer’s responsibility until they arrive at our warehouse. Faulty items - If you receive an item that is faulty, we will send you a pre-paid label for return. Just use the contact us page to request one, sending images of the fault. 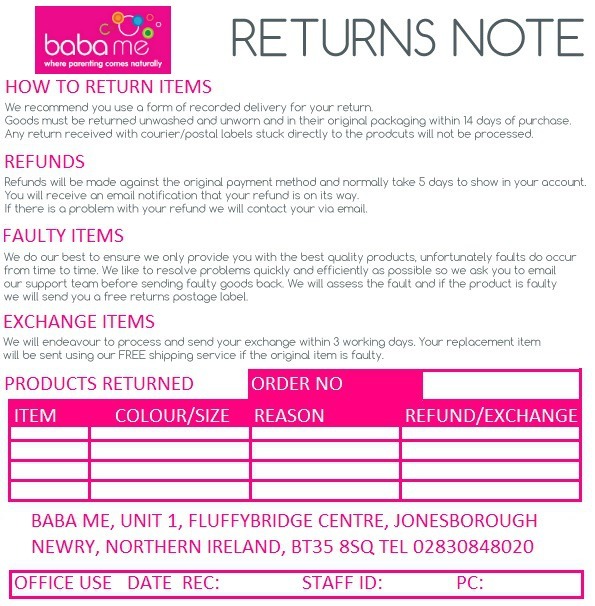 Store Return Can I return a telephone or Web order at the Baba Me shop? - Yes, you can return non-faulty goods to our shop. You will need to take your Invoice/Receipt with you as proof of purchase. Depending on staff present, the refund will be processed immediately or tasked to customer services to refund (not all store staff are trained in online refunds). Find a Rainbow Prize - Congratulations you have won a prize!